Ameno World Najib Belanjakan 3.5 Juta Dalam Percutian Di Luar Negara. Najib Belanjakan 3.5 Juta Dalam Percutian Di Luar Negara. Najib Belanjakan 3.5 Juta Dalam Percutian Di Luar Negara. Pada yang gagal mengakses laman web Sarawak Report boleh baca kat bawah neh. Aku copy paste untuk bacaan korang. Kot2 jenis nak baca full version ke bukan jenis laporan berita atau versi di bahasamelayukan ke. 1. Pada tahun 2014, Najib membelanjakan 3.5juta ringgit Malaysia dalam percutian musim panas. 2. Menerusi 2 kad kredit, Visa dan Mastercard. Satu dari CIMB dan satu lagi dari Maybank. 3. SR melaporkan bahawa Najib membelanjakan amount tersebut ketika berada di Europe. 4. Pada tahun 2013, ketika menghabiskan cuti krismas bersama Riza, Rosmah menginap di hotel Bel Air, Beverly Hill dan belanjakan US300,000 untuk penginapan tersebut. Artikel oleh SR sebenarnya memfocuskan kepada gaya hidup mewah yang diamalkan oleh Najib Razak suami isteri sejak menerima dana 2.6b dari luar negara. Dalam laporan tersebut juga menyatakan mereka mempunyai segala bukti kukuh bagi dakwaan berkenaan. Prime Minister Najib Razak splashed over US$1 million on his credit cards during the month of August in the year following the election, according to information received by Sarawak Report. The spending took place in Europe while he was on a summer holiday. For most people to run up such a bill on mere expenses while on holiday would seem astounding, but the Prime Minister has always declined to explain how such conspicuous spending has been funded. The bills were run up on two cards Najib was using in August 2014, a Visa and a MasterCard from CIMB & Maybank. Over RM3.5 million was splashed on the Visa and MasterCards in just the one month. Sarawak Report has further details. Where does Malaysia’s ‘First Family’ get all their money? This is just the latest information about conspicuous spending by Najib and his wife, but it comes after Malaysia was left wondering why he had transferred US$650 million out of the country, from money which he had earlier explained was a donation to UMNO. The Prime Minister and his wife have attracted world-wide scrutiny caused by their ostentatiousness. In the United States news has seeped out of a jaw-dropping bill covering Rosmah’s stay at the Hotel Bel-Air, Beverly Hills, while spending Christmas with her son Riza in 2013. Her bill for a week’s stay at the Hotel was over US$300,000, reliable sources have informed us. Hollywood luxury…. but most guests don’t spend US$300,000 on a visit. There have been numerous other reports of eye-catching spending, including the millions spent this year on the couple’s extended wedding celebrations for Rosmah’s daughter and a series of expensive houses purchased for Riza Aziz in the United States. Last month Sarawak Report detailed how Rosmah’s fabled addiction to buying hugely expensive jewellery is managed through the same businessman who has been identified as the Prime Minister’s proxy at 1MDB, Jho Low. If Malaysia is a country governed by the rule of law, it is therefore now incumbent on the Prime Minister to substantiate the series of unsustainable claims that have recently been made about supposed anonymous and secret ‘donations’ to UMNO into his personal accounts and missing billions from 1MDB being held in ‘units’ in banks. Najib Razak has noticeably failed to deny our statement last week that over US$650 million were transferred back from his personal account in KL (supposedly from a secret ‘donation’ on behalf of UMNO) to the account in Falcon Bank in Singapore from where US$681 had originally been paid. Our information is that there was in fact over a billion dollars from various sources in this particular AmPrivate Bank account in KL, belonging to Najib, in the period preceding what has been widely recognised as a bought election. The US$650 was what remained when he closed the account in August 2013. The Prime Minister has now after weeks of implied denial admitted the payment into this account of US$681 million, but is remaining silent over our latest information about where the remainder of this and the other sums was transferred. 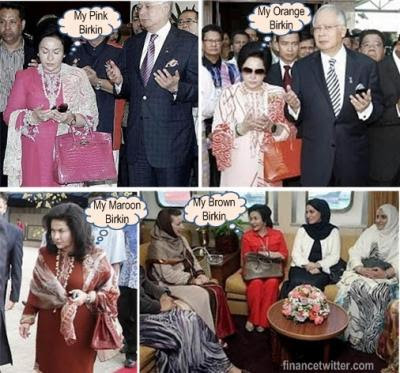 Najib the centre of attention on the PetroSaudi yacht in 2009 – he was the rainmaker after all. He has also provided no evidence of even a shred of accountability over the expenditure of money that he says he was holding on behalf of the party and “not for personal use”. Instead, his supporters have started to imply that a Malaysian Prime Minister (unlike for example a US President) should be considered to be above the law and that any attempt to investigate this matter should be treated as a crime, rather than any crime itself. The same supporters are now also claiming that the hallowed tradition of a vote of no confidence in a Prime Minister (used as the standard tool in parliaments across the world for getting rid of duds) should also be considered to be an illegal and unconstitutional device in Malaysia against Najib Razak. 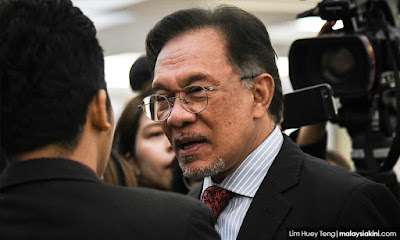 The rest of Malaysia, however, will be forced in the absence of credible explanations to make inevitable deductions regarding the unexplained disappearances of public money and the coincidental but equally unexplained conspicuous spending of the person who was last handling it. -SR.
Tag : Najib Belanjakan 3.5 Juta Dalam Percutian Di Luar Negara.